Happy (Belated) New Year to my Juicy Bites readers! Once again, sorry for the long lapse between posts. I know I am starting to sound like a broken record here, so I won’t bore you with all of my excuses for neglecting my little juicy blog. 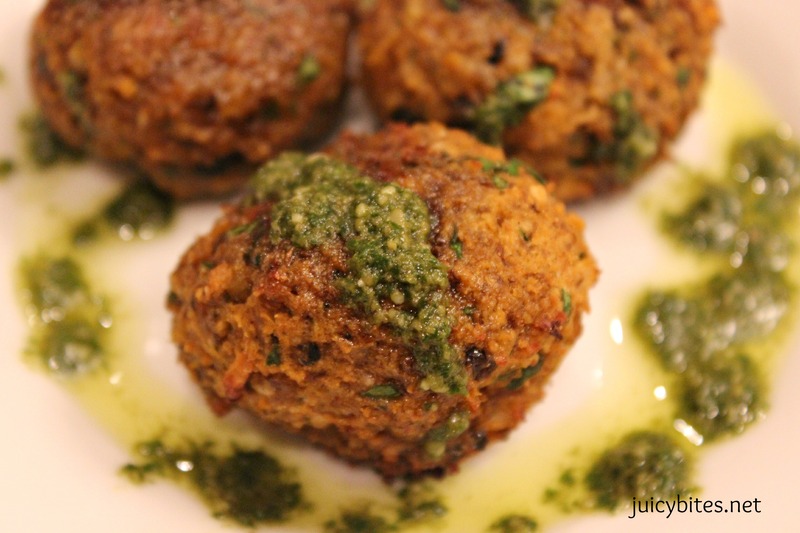 I will get right to talking about these delectable little meatless “meatballs”. I, like everyone else, started the new year with resolutions to eat better. For me, a healthier diet means eating less meat and eating more veggies, whole grains, and legumes. So when I came across this recipe on Gwyneth Paltrow’s blog, Goop, I was eager to try it! I’m so glad I did…they were delicious and satisfying! I tried my had at a quinoa burger last week in hopes that it would make a great post. They were really tasty, but didn’t hold together well. I will have to work on the recipe some more before it makes it’s debut on Juicy Bites. 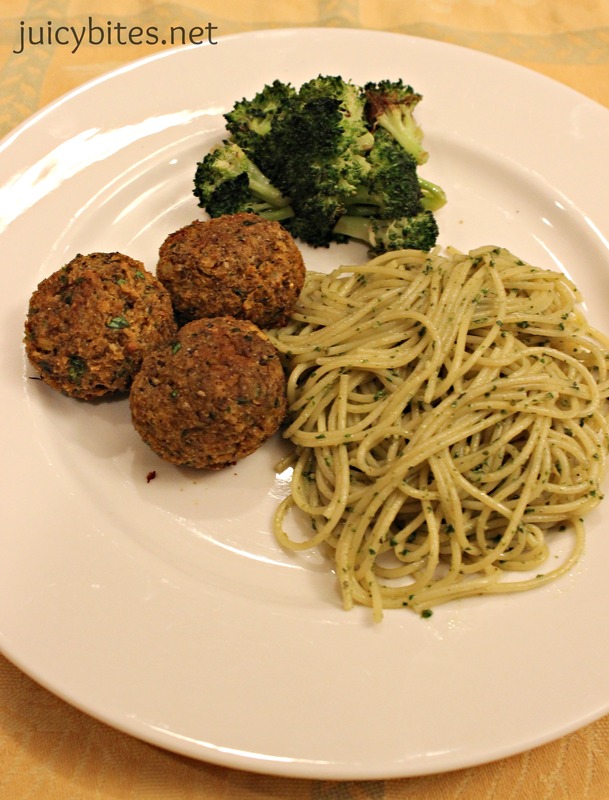 These meatballs were really simple to make, especially if you have precooked lentils like I did. Trader Joes sells them in their refrigerated produce section and they worked perfect. You do need a food processor (a mini one worked for me) to puree the lentils. The pureed lentils are combined with some sauteed onion and garlic, some herbs, and a little bit of rich ricotta cheese and nutty parmesan. They are a bit messy to form but hold together well and at least you don’t have to scrub any “raw meat residue” off your hands when you are done! I love that they can be made ahead of time and baked later. These little guys are such a versatile protein and can be served in many different ways. We had them with pasta and my home made pesto and some roasted broccoli. I think they would be great with a hearty marinara sauce, or in a pita with a yogurt sauce. My family loved them and they are looking forward to the left overs. They would freeze well after they are cooked if you wanted to make a double batch. Even if you are not a vegetarian, don’t be afraid to try these. 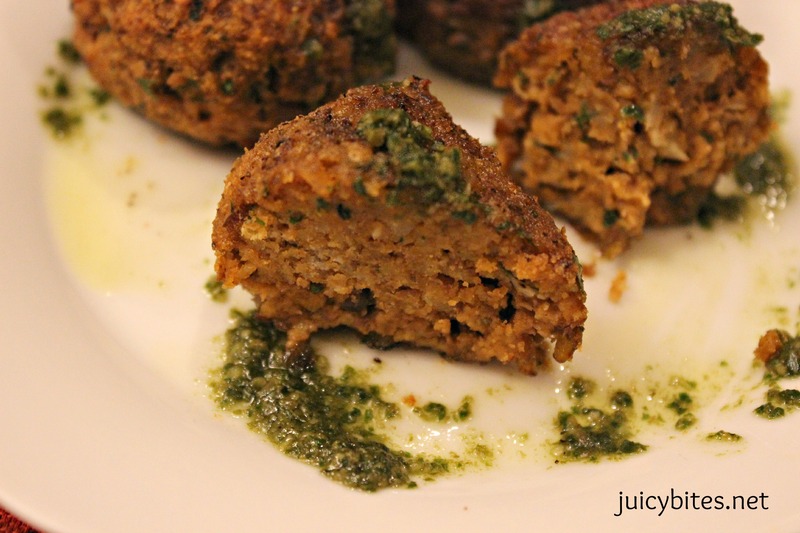 They are delicious and filling and taste MUCH better than the typical soy-based meatless “meatball” you find in stores (which are usually loaded with ingredients that I can’t even pronounce). They are a great way to add more legumes into your diet which give you a powerful combination of B vitamins, calcium, potassium and folate. Drizzle a pan with olive oil, place over medium high heat and add the chopped onion. Sauté for a couple of minutes until translucent and softened. Add the garlic, dried thyme, and a pinch of salt and pepper, and sauté for about another minute or two until soft and fragrant. Turn off heat and set aside to cool. Place lentils in a food processor with tomato paste and a drizzle of olive oil (about a tablespoon) and pulse until smooth. In a large bowl, beat the eggs and ricotta together until mixed well. Add lentils and mix together until smooth. Add the cooked/cooled onion and garlic mixture from the frying pan, the parmesan, the panko breadcrumbs, and the parsley. Season well with salt and pepper (I used about a teaspoon of kosher salt and several turns on my pepper mill). Mix well until everything is combined. If the mixture is still feeling wet, add a little more breadcrumbs until the mixture is dry enough to stick together and roll into balls. Coat a baking sheet with non-stick spray or olive oil (I lined mine with foil first to save time on clean up). 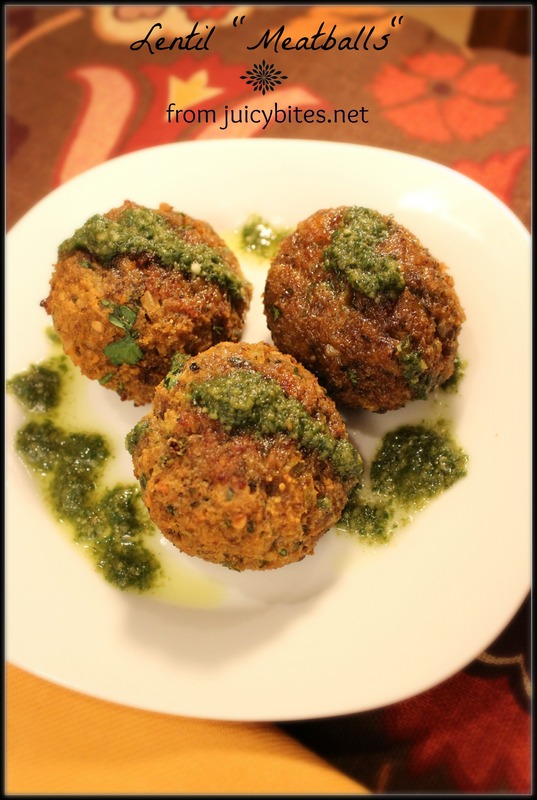 Form the lentil mixture into balls with your hands (mine made around 18 meatballs). A little olive oil on your hands helps the mixture from sticking while you form them. 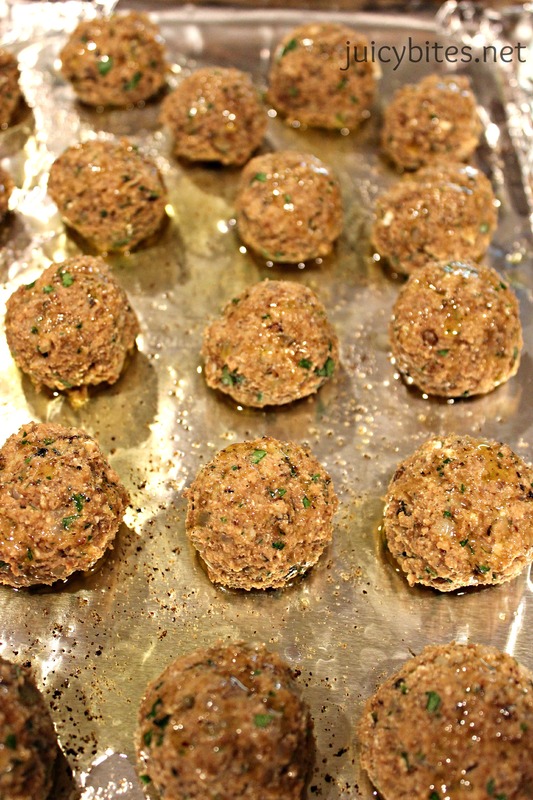 Drizzle more olive oil over the top of the meatballs and bake for about 20 to 25 minutes. Gently turn half way through so that they brown evenly. Wow, Rhonda these look amazing! I am totally pinning these to make soon. Thanks! Thanks, Shira! They made great left overs in lavash with spinach and tzatziki for lunch the next day. Hope you enjoy them! These look delicious. Do they freeze well? Thanks, Amanda! They are really tasty. The second time I made them, I did freeze a few to have as left overs. They re-heated really nicely in my little toaster oven. I wouldn’t microwave them though, I think the consistency would not be as good. They were great for a quick weekday lunch with a salad! Should have mentioned…I froze mine after I cooked them, not uncooked.